Pine makes a great option for flooring of many different styles. 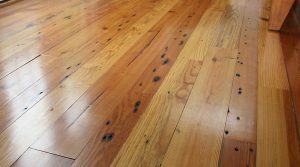 Pine wood has been used for flooring purposes for over 200 years. Technically, pine is not considered a hardwood, but the durability of this wood has been proven time and again in both the construction and flooring industries, and some varieties approach the hardness levels of the softer hardwoods. And since pine is abundant in the United States, it makes a sound, economical option for homeowners looking for a beautiful new wood floor! Pine trees grow naturally across the entirety of the Northern Hemisphere and are popularly what’s thought of when one thinks of Christmas. They are tall and slender with pine cones and fragrant needles. Pines are ideal for harvesting purposes because they grow really quickly relative to other trees. Not only do they grow quickly, they also live a long time – in fact, a Bristlcone Pine called Methuselah is considered to be the oldest living organism on Earth, at around 4,600 years old! While there are several different varieties of pine trees out there, two of them are primarily used for flooring purposes. These are the Southern Yellow Pine and the Heart Pine. Southern Yellow Pine: This type of wood is very versatile and can be used for a wide range of looks and purposes. It ranges in color from light yellow to light beige and can come in a sophisticated uniform look or knotty, rustic look depending on the cut. It is generally around 60-70% as hard as red Oak wood but is a little more stable and suitable for areas where a moderate amount of wear is to be expected. Heart Pine: Heart pine tends to be darker in color than the yellow variety and often come with dark streaks known as sap stains. Over time, the yellow hues of this type of wood will give way to warmer reddish tones over the course of time. Heart pine is loved for its classic charm and character. If you’re ready for a new wood floor made with pine in your home, talk to the professionals at Jason Brown Wood Floors today! This entry was posted on Friday, April 21st, 2017 at 2:41 pm. Both comments and pings are currently closed.